Time to talk about what other machines can run on the Next hardware! "ZX Spectrum Next" can be adjusted to specification of Spectrum clone machine by TBBlue config menu or dot command. A video of a demo program for "Pentagon 128" has been posted on official facebook since last month. By the way, adding TSConf's "Sprite and Tile" screen and two SID Sound to the core of the specification of "ZXSpectrum 128", how many LEs will the core be? In order to make arcade style games more easily and casually, I came up with another machine as "Option core". Lately, I opened a "2B board" and started using it as a game machine. I tried work to upgrade the system core from "1.00.00" to 1.00.10 or 1.00.51. When the "TBBlue" logo mark is displayed, pressing the "U" key on the PS/2 keyboard will bring up a screen to confirm the firmware recorded on the SD card. It took less than 1 minute to erase and update. Normally, to update "FPGA", create a JIC file or rewrite it using "Quartus" application on Windows PC with USB blaster installed. On the other hand, "ZXUno" or "TBBlue" will rewrite if you select the core on the flash on the menu screen, and since there is an Anti-brick system, it can be said that renewal of the FPGA is easy. However, it takes time to update the core "one minute", and it is difficult to explain the Anti-brick system. I think that it is not realistic to distribute the "new machine" in the SD card of the application along with the application. There are 32 positions in the flash to store cores. Positions 0 and 1 are reserved for the anti-brick and zx next cores respectively. During a normal boot process, two cores are in fact loaded by the fpga. At power up, it is the anti-brick core that is loaded into the fpga and runs the boot process. The zx next core is loaded in the final step before machine reset. If the firmware is changed on an sd card, it can be reprogrammed to load any core on machine reset so it would be very easy to distribute sd cards for other cores. The core only has to be saved into the flash (that's the one minute process you spoke about) and after that the machine could boot into that core just like the zx next is normally booted into. Please give me a manual or wiki that summarizes the specifications of "sprite chip" in English! I can also use TSConf on the FPGA machine, so I would like to create something application. I am reading the TSLab forum which is introduced in the reply from chernandezba. I also found an article link from VBI on "Tile & Sprite". Also, there is a thread of topics similar to here on the ZX-Uno Forum. However, when I bring this topic already, I am watching them. In GitHub I found a document folder of "TS-Conf" project (quoted in the article) and the "ZX-Evolution" project in its upper directory. I will comment on after reading a little more. Should I post before I can understand the specification of "Baseconf"? It's true to the Russian spectrum scene I think - it's not got a pretty case design like the Next, but it's way more powerful in many other ways. The I/O port documentation isn't that hard to read with a translation tool. - Video is based on the ATM modes (up to 640x200 multicolour, 320x200x16 colour and 80x25 text mode), with some seriously weird mappings. Somewhat better than the limited Timex modes on the Next but also nothing in baseconf equivalent to layer2 (see TSconf though) and no copper equivalent. - IDE controller similar to NemoIDE rather than the UK Div*. Read performance is as good as DivIDE (or better than the naïve DivIDE implementation due to ULA wait states). Write is slower. Or you can boot it in ts-conf which doesn't have some of the ATM video modes but instead has tiled video, and some very powerful sprite modes. Kind of two machines in one. Last edited by EtchedPixels on Sat Dec 08, 2018 10:07 pm, edited 1 time in total. As an aside you really want to emulate not the Pentagon 128 but the later Pentagons, and you need the disk emulation parts of it and TR-DOS stuff. The later Pentagon allows you to map RAM bank 0 at 0000-3FFF and that is rather useful for all kinds of things. Last edited by vbi on Sat Feb 23, 2019 11:41 am, edited 1 time in total. I would like to start a series of articles regarding the subject already well known to Russian ZX sceners, that made a kind of hype in due time. Some call it modern replica, some — non ZX. 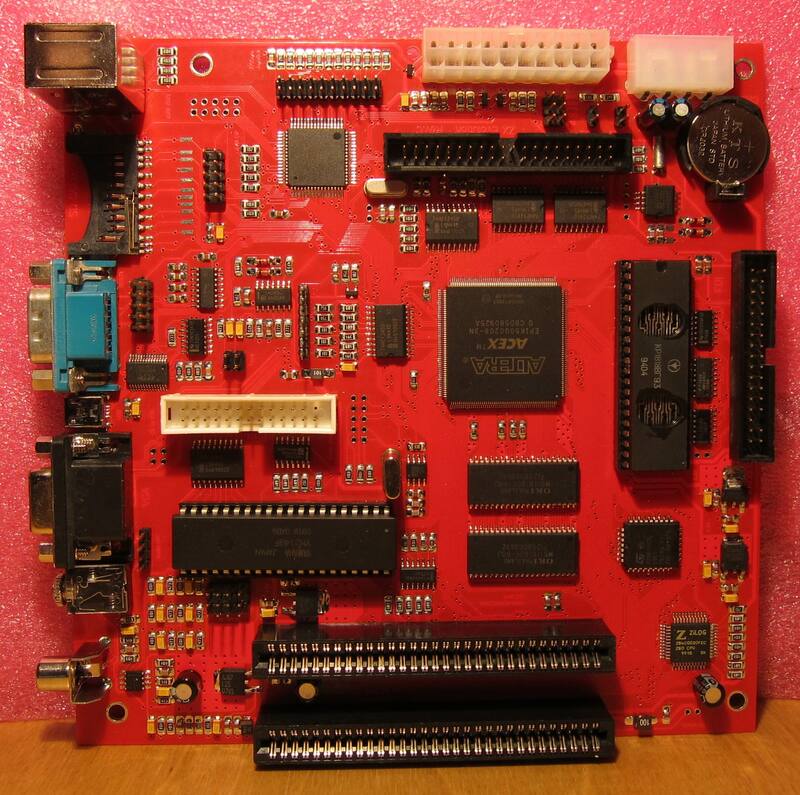 The topic is TS-Config for ZX-Evolution board. This article is a plain overview to give you a taste of the matter. ZX is notable for extensively using its CPU for every hard work done in demo — graphics, music and finally math. Emerging of AY chip saved the performance used in sound generation and limited CPU responsibility to the player routine processing, which is much more convenient in comparison to the beeper bit-banging. So, why not to save graphics jobs for CPU. I decided to add a set of features that will ease some routine tasks typically performed in demo. I selected Pentagon-128 as a baseline since the great bulk of Russian demoscene is tailored for it. Resulting machine is fully compatible with its prototype in spite of having a number of things inconceivable on ZX. What's added? Graphic modes primarily. Three additional modes are available: 16 or 256 palettized colors per pixel and a text mode with a loadable font. It's not a big deal nowadays to develop a color-per-pixel mode, but it needs a smidgen of sagacity to develop it to be practically useful. Let's think of addressing in the first place and make it as simple as possible for the CPU. How about INC L for next pixel and INC H for new line? Yep, that's it, and we keep this idea intact throughout the whole architecture. Every addressing is folded within its assigned space and addresses are a multiples of power of two, no knotty computing anymore! Now add a hardware pixel accurate scrollers to them which allow to move the pixel field without any memory transfers at all. The most time consuming task on ZX has always been sprites drawing. Also, one can calculate how huge amount of memory space a color-per-pixel graphics will occupy. We bump into the CPU performance if we want to process pixels by software. And there exists a solution: a dedicated graphic engine. We even have two possible choices for this purpose: a blitter and a tile-sprite unit (TSU). Blitter, which is actually a mode of DMA (yeah, we have DMA), allows us to build a game room (given that we talk of a game) in 256 colors using tiled images stored in RAM. TSU provides purely hardware display of two types of objects: tiled 'text mode' planes and rectangular graphic objects known as 'sprites'. It is much faster to change a couple of bytes to move 64x64 pixel area or change its palette rather than transfer 2 kilobytes of graphics array. OK, what about CPU performance? No radical improvements in this area, although CPU clock can be set up to 14MHz which is four times as fast as original Pentagon. And to make life easier the interrupt controller was upgraded to support some new modes like line or blitter interrupts with dedicated vectors. The purely philosophical question: 'can the art of coding be ever shown up on this ZX on steroids?' has a simple answer: you are allowed to use the architecture up to the acceleration level you choose. And no one bans you to write a tricky routines to feature your craft, if you are able to. So hold your breath and let's go deeper into the TS-Config from next time on.